Separate waistband, no folding over. I just happened to have this awesome remnant from Billie's Designer Fabrics that is the perfect length. It used up the entire height - cut edge to cut edge - with just enough remaining to cut a waistband. I used a combination of the Sewing Cake Espresso Leggings and Jan's Shortie Leggings, though I've opted for no gusset this time. I didn't have enough of the rainbow fabric to make a cuff, so I opted for white. I think that'll be a nice contrast. My favorite waistband was made in 2006 or earlier when I sewed this "You're Getting Sleepy" skirt from a Burda Magazine to wear to hot rod shows. The electric purple perfectly complimented many a paint job and holds the feel of the wild Tiki and go go girl colors and patterns. I learned how to make this smooth waistband with knits from a Threads magazine. Must dig that out so I can share with you. 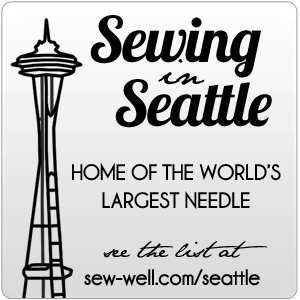 It transformed me from an average sewist into someone who sewed professional looking knits. I was thrilled. Here are a few photos for your viewing pleasure and studies.